Well, this review I found in a back Issue of the now defunct RAW magazine (issue 28 in case you want to track it down) covers one of the first FISH shows I saw. A black and white version of this clipping appeared in an early 'Company' magazine but here you see it in colour possibly for the first time. 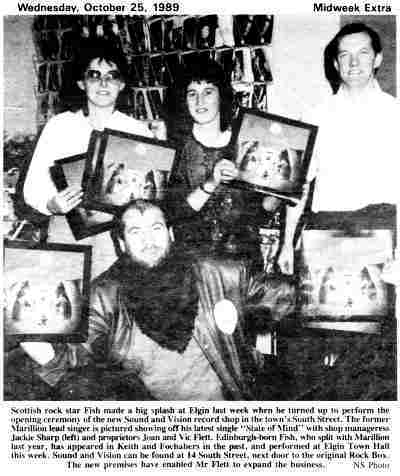 During the afternoon Fish signed copies of the newly releases single 'State of Mind' which had been released that day in the local record shop, Rockbox. The clipping above was printed in the following Fridays Northern Scot, the local paper. Having just listened to 'The Complete BBC Sessions' CD, more than half of which was recorded less than a month after this show, I've been reminded just how much I enjoyed this period of the big mans career. 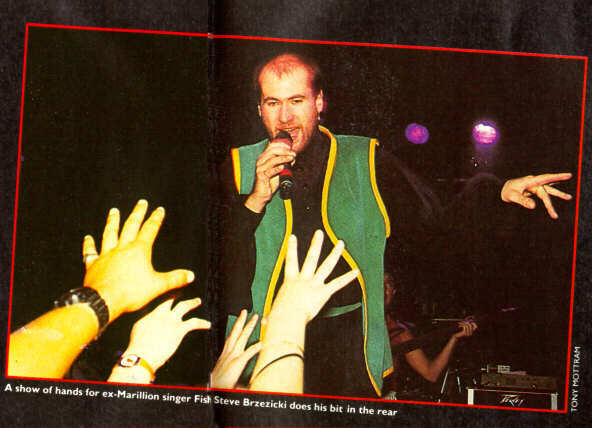 Despite the hassles involved in the split from Marillion just over a year earlier Fish was positive in outlook to the future. This would all change in the next couple of years but his attitude and the enthusiasm of the band really shone during this tour. 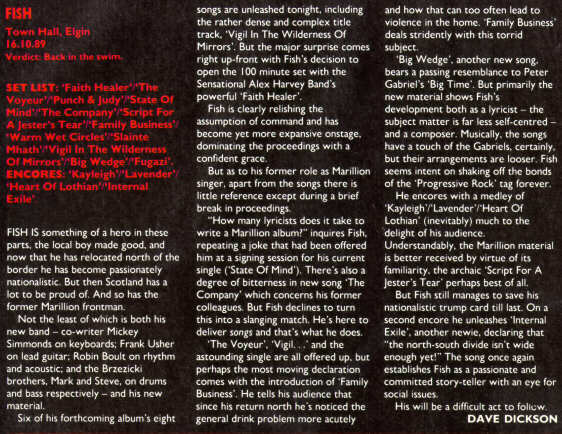 Lyrically Fish was covering a variety of subjects which, as the review below mentions, seemed less personal but still struck home to the audience, especially the Scottish one. After the next album, 'Internal Exile' the Scottish flavour would wane as the English audience in particular lost interest but that change is what eventually dissipated my interest for a number of years. This page is Copyright © Doug Anderson 2000 - 2003. Created: 5 April 2001. Last updated: 2 February, 2003.